The 101 Action Movies brings me yet another awesome movie I had never seen, and features a very young Jet Li. Witnessing the murder of his father by an evil general who has rebelled against the emperor and installed himself as a the new ruler . 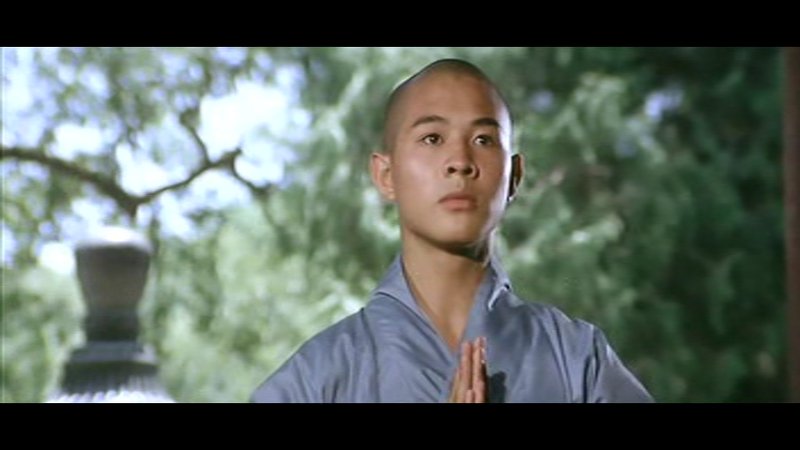 Young Jue Yuan (Li) makes an escape and injured finds himself on the steps of the great Shaolin temple whose Buddhist monks take him in, nursing him back to the health, with the aid of a master’s daughter, Bai Wu Xia (Ding Lan). 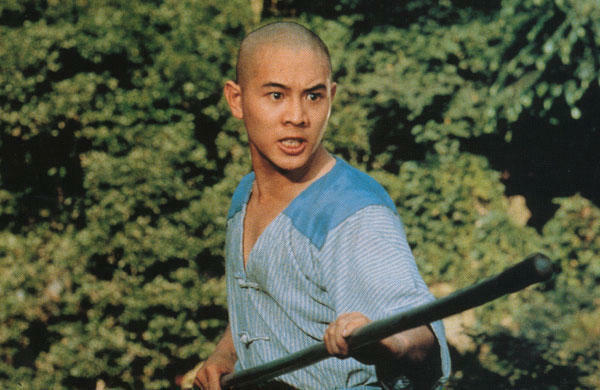 Seeing a chance at exacting his revenge on the evil general, Jue begs to be taken on, to learn kung-fu, and fight. Despite some misgivings, especially since they do not believe in murder, and that the Shaolin way dictates it only be used for protection and never aggression, they decide to begin his training. But Jue is impatient, and wants it all now, unwilling to completely embrace his training, until after a confrontation with the general shows that he is nowhere near ready yet, and has much to learn. Then he trains, constantly, in a very nice montage sequence that shows the seasons changing around him as he practices, practices and practices. But it never seems like enough, and he has a problem embracing the full Buddhist experience. Then the general shows up on the temple’s front door, threatening to burn it all down and kill everyone if they will not turn over Jue and an escaped prisoner. The final fight sequence runs almost a full twenty minutes and is simply stunning! There are a variety of styles and weapons at work, and everything moves fast, and no one seems to be faster than Jet Li, he just moves so incredibly quick, is amazing to watch. Also of note here, is the locations, there are some amazing shots and places put on camera, especially a carved cave face with statuary and art work. The story is fairly thin as we watch Jue waver back and forth over the line of being dedicated to monkhood and wanting revenge, but the fight scenes, and training sequences more than make up for it. There’s a sequence Jue spies on featuring the monks exhibiting their skills in a green field, and there are some amazing moves and acrobatics. The kung-fu is beautiful, the locations lovely, so it allows you to kind of forget that you’ve seen variations on this story a number of times. It’s alright though, because Li holds your attention, and makes everything look so fluid and effortless. It really is amazing to watch him perform. I do like when the list brings me movies I’d never even heard of and this was definitely was one of those. Have you seen it? What other Jet Li films are worth a look?